All Dilley homes currently listed for sale in Dilley as of 04/22/2019 are shown below. You can change the search criteria at any time by pressing the 'Change Search' button below. If you have any questions or you would like more information about any Dilley homes for sale or other Dilley real estate, please contact us and one of our knowledgeable Dilley REALTORS® would be pleased to assist you. 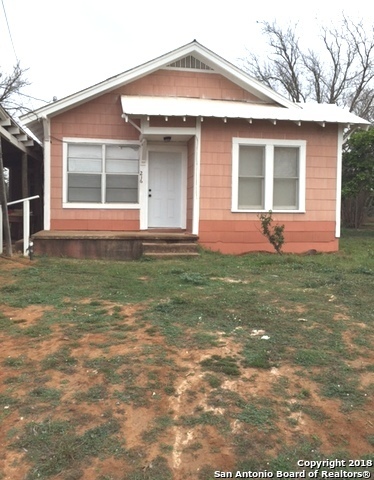 "Well maintained 4 bedroom/2 bath Ceramic tile floors throughout, high ceilings, wood beams. Beautiful atrium, covered front and back porches. Recently replaced water heater. Great home or investment property (close to Eagle Ford Shale) Extra Bath can be added to 4th bedroom for increased rental rates. Currently generating income." "Two houses for the price of one!Main House has newly installed plumbing, electrical wiring, sheetrock,insulation,central a/c and heat unit,toilets, vanities,tub & shower,water heater,flooring,ceiling fans and lighting. Metal roof has been sealed and painted. 2017 the foundation was leveled. The efficiency behind the main house is a potential rental or personal office space/studio. Property has an underground storm shelter between homes. Additional storage units on property. Seller is ready for q"
"Wow Don't Wait to Jump On This One!! Completely Remodeled Home on Large Corner Lot - Just Reduced- Ready to Go - 2 Bedrooms 1 Bathroom - New Roof, New Flooring, Fresh Texture and Paint, All New Fixtures and Hardware, New Fence, Decks, and Carport - 3 Window Units will Stay with the Home as well as the Living Room Couches, Ottoman, Refrigerator, and Appliances - What Are You Waiting For? All Showings After 3PM - 30 Day Close or Sooner - See it Today!!! Send All Offers"